CSIRO and industry partners today launched a two-year research program to improve efficiency of carbon dioxide (CO2) capture. CSIRO, AGL Energy (AGL), Brown Coal Innovation Australia and Japan’s IHI Corporation are partnering on the PICA post-combustion capture research project which will evaluate innovative processes using gases drawn from AGL Loy Yang brown coal-fired power station in south-eastern Victoria. While CO2 is already being captured at large scale around the world, cost and efficiency challenges remain an impediment to wide-scale commercial implementation. This research program is targeting a 40 per cent reduction in energy use of current capture processes in order to overcome these challenges. Throughout the two-year program, researchers will examine the energy efficiency of CO2 capture configurations, the effectiveness of two new solvents into which CO2 will be absorbed, and measure the total amount of CO2 removed. The PICA (derived from first letters of PCC, IHI, CSIRO, AGL) research plant is 21 metres high and was built by IHI in Japan and transported to the Latrobe Valley where it will operate around the clock, capturing 150 to 200 tonnes of CO2 each year. CSIRO Energy Director Dr Peter Mayfield said CSIRO was excited to embark on the PICA research journey as part of its support of mitigation research efforts to reduce greenhouse gas emissions and ensure Australia’s energy security. “CO2 capture can be applied to both energy generation and industrial processes,” Dr Mayfield said. AGL’s Executive General Manager, Group Operations, Doug Jackson said AGL had committed to decarbonisation by 2050 and technology innovation would be critical in the transition to a lower carbon emissions energy sector. “The new age of power generation will require a range of innovative technologies,” Mr Jackson said. “AGL recognises that support for technology innovation is critical – this is true of both renewable and thermal generation. BCIA Chief Executive Officer Dr Phil Gurney said to meet Australia’s commitment to limit dangerous climate change, emissions of CO2 from the use of coal must be reduced. 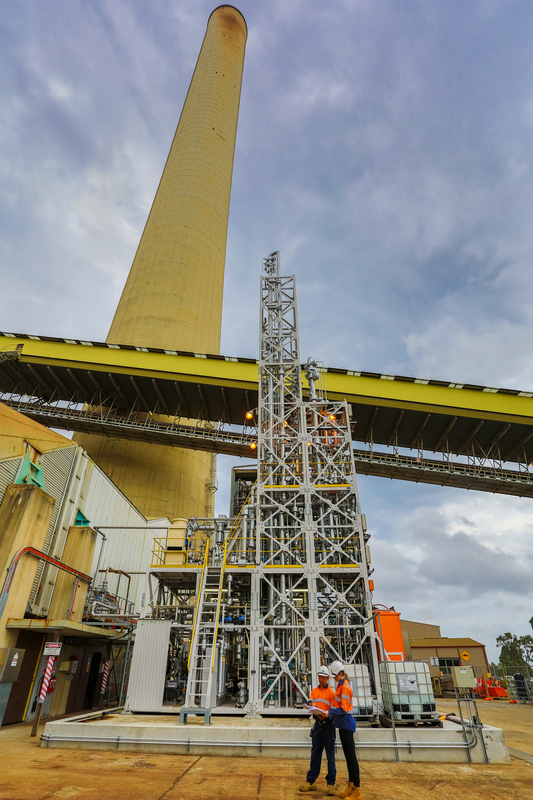 “BCIA has invested heavily in research and development to improve the efficiency of brown coal power generation and reduce the costs of carbon capture technologies,” Dr Gurney said. IHI Corporation’s Executive Officer, Vice President of Energy and Plant Operations, Mr Yahagi also noted the importance of CO2 capture for continued operation of coal-fired power plants. “Without doubt, this PICA project will be a great catalyst for the future of low-emissions technologies in both the Australian and Japanese coal and energy industries,” Mr Yahagi said. PICA post-combustion capture project against AGL Loy Yang brown coal-fired power station. 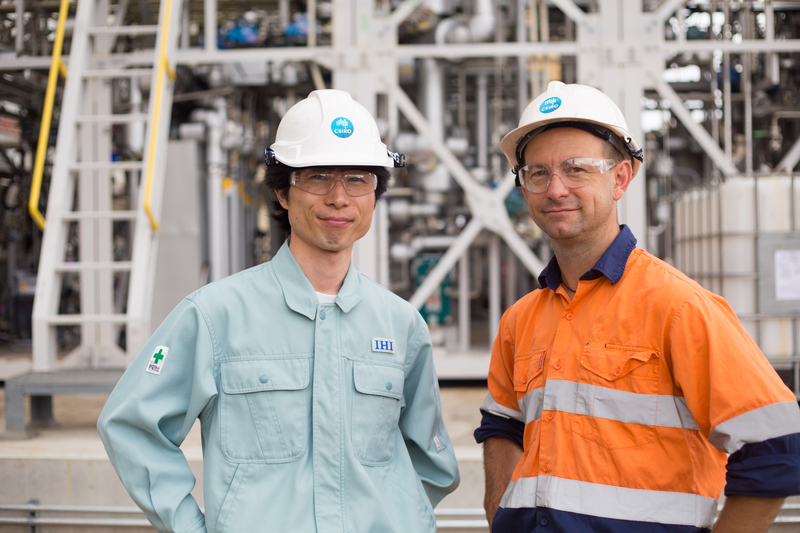 IHI Corporation's Jun Arakawa and CSIRO's Aaron Cottrell in front of the PICA post-combustion capture project. 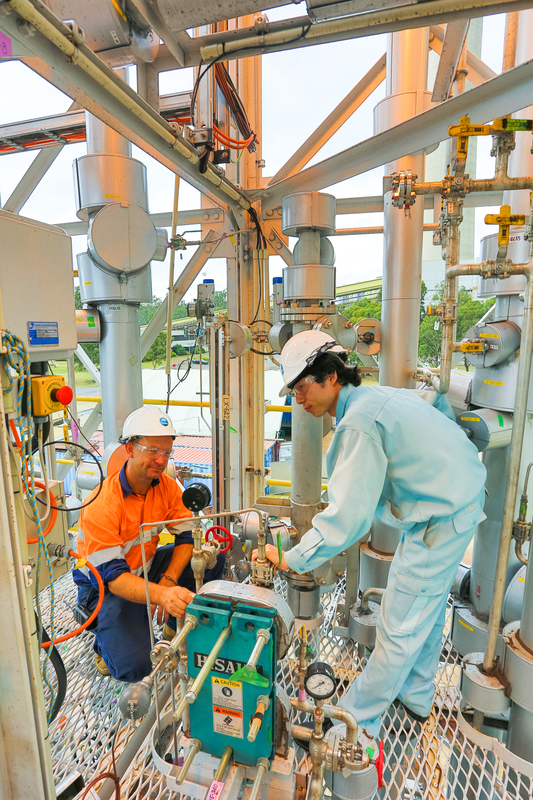 CSIRO's Aaron Cottrell and IHI Corporation's Jun Arakawa work on the PICA post-combustion capture project. Carbon capture is the first step of the carbon capture and storage (CCS) process, whereby large quantities of CO2 are prevented from being released into the atmosphere. PICA builds on CSIRO’s existing PCC program at Loy Yang, which began operation in 2008. CSIRO personnel will also run the new PICA plant. In 2008 at Loy Yang power station, CO2 was captured from a power station flue gases in a post combustion capture pilot plant for the first time in the Southern Hemisphere. The $5.3M PICA project is partly funded by a $650,000 research and development grant from Brown Coal Innovation Australia (BCIA). PCC technology can be retrofitted to existing power plants or integrated with new infrastructure to achieve a range of CO2 reductions, from partial benefit to full capture capacity. It is expected the PICA plant testing and evaluation campaigns will be completed by the end of 2017.